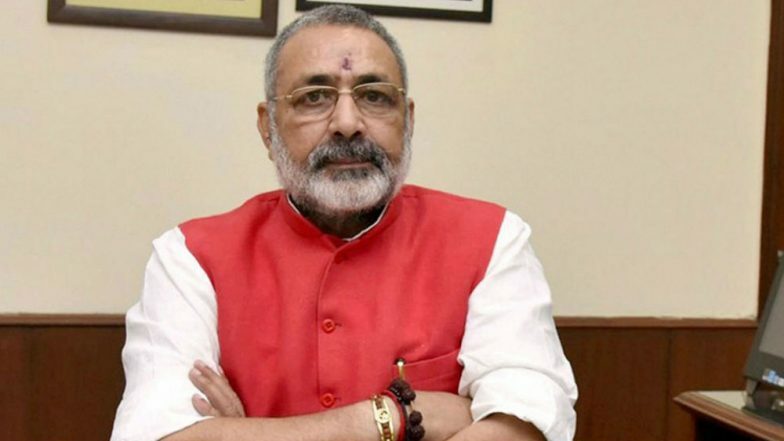 Patna, March 7: Union Minister Giriraj Singh is upset with his party, the BJP, as the national leadership has reportedly agreed to give the Nawada parliamentary seat in Bihar that he represents to the LJP, an NDA constituent. The Nawada seat is said to have gone to the LJP under the seat-sharing formula finalised by the NDA. Though formal seat allocations and the names of NDA candidates are yet to be made public, a senior LJP leader said the party will contest from Nawada and give up the Munger seat it holds. "It was decided at a meeting of (BJP president) Amit Shah, (Bihar Chief Minister) Nitish Kumar and (LJP chief and Union Minister) Ram Vilas Paswan that the LJP will be given the Nawada seat in lieu of leaving the Munger seat for ally JD-U. LJP has made up its mind to contest from Nawada," the LJP leader said. Lok Sabha Elections 2019: AIADMK, BJP Sign Electoral Pact; BJP to Contest Poll on 5 Seats in Tamil Nadu. "Giriraj Singh is not ready for this and refused the offer. He is adamant on contesting from Nawada," a BJP leader close to him said. "To date, nothing has been finalised. Everything is in the process of finalisation; anything is pissible," a BJP leader here said. Giriraj Singh, known for his controversial statements, has been keeping away from the media since last Sunday when he failed to attend Prime Minister Narendra Modi's Sankalp rally on health grounds. BJP leaders close to him said he was suffering from viral fever. The Opposition RJD, Congress and RLSP taunted Giriraj Singh as he had stated that it would be clear from those who didn't attend Modi's March 3 rally in Patna as to who supported Pakistan, when he himself failed to attend the event. Belonging to a landed and powerful upper caste Bhumihar family, Nawada is a safe seat for him against the backdrop of Bihar's caste-ridden politics. Nawada, with a sizeable population of Bhumihars, followed by Nitish Kumar's Kurmis, as also Dalits and Extreme Backward Castes (EBCs), is seen as a solid social support base for the NDA, particularly the BJP. The rival RJD-led Grand Alliance enjoys the support of Lalu Prasad's Yadavs, as also Muslims, Kushwahas, Dalits and EBCs. Sources in the NDA said the LJP's Veena Devi, wife of former MP Surajbhan Singh, a criminal-turned-politician, will vacate her Munger seat and will contest from Nawada. She is also a Bhumihar. Interestingly, JD-U president Nitish Kumar has convinced the BJP to give his party the Munger seat as his close friend and senior party leader Lalan Singh, a Bihar minister, is keen to contest from there. Lalan Singh, a Bhumihar, had won from Munger in 2009 seat but lost in 2014 when the JD-U was not part of the NDA and contested the polls alone.